The US private equity owner of Boost Juice believes the convenience food retailer has almost reached its saturation point in Australia and has pinpointed Asia to drive superior growth rates in coming years. 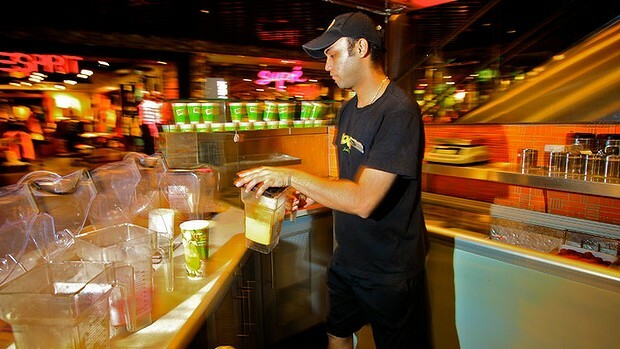 Retail Zoo, a holding company which owns a majority stake in Boost Juice and Boost Juice International, believes it can still squeeze more of its juice stores in Australia, taking advantage of a 5 per cent drop in internal costs to make openings in lower-traffic shopping centres possible, but will turn to Singapore and Malaysia for an earnings kick. Chief executive Scott Meneilly told Business Day comparable store growth for Boost Juice in Australia had retreated from the double-digit highs experienced in the early years of the business to presently sit at around 3 to 4 per cent, suggesting the chain was starting to hit maturity in the domestic market. ”And for us that’s actually fantastic because then it’s moved away from being a fad brand and something just going crazy for the moment, to good continued sustainable growth and that’s what we look for and want to be part of consumers’ every-week habits,” Mr Meneilly said. Founded by husband and wife team Janine and Jeff Allis in 2000, Boost Juice quickly spread its footprint across Australia to have 206 stores today as well as a presence in the UK, South Africa, India, Malaysia and Singapore. US-based private equity firm Riverside Capital paid roughly $65 million in early 2011 to purchase a controlling stake in Boost Juice, crystallising gains for the Allis family and major investors, the Besen family. It now sits under the Retail Zoo corporate banner which also owns Salsa’s Fresh Mex Grill with those businesses joined by Adelaide’s espresso bar group CIBO Espresso in December 2012. Its latest financial results show Retail Zoo posted a 30 per cent increase in network sales revenue across its food brands to $221 million while EBITDA in the past 12 months hit $17.6 million with bottom line growth of 24 per cent. Salsa’s Fresh Mex saw sales increase from $28.6 million to $39.6 million, a rise of 34 per cent growth in top line sales. Boost Juice, the biggest contributor to the result, had network sales of $155 million for 2012-13, up 9 per cent from $141 million the year before. Mr Meneilly said there was capacity for up to 36 new sites in Australia in the near term thanks to efficiency gains. ”We have always believed that the [Boost Juice] business saturation point would sit somewhere around the 200 store mark and we forecast 30 to 36 new sites in the next three years. Boost Juice had pulled out of China after disagreements with its partner there over the direction of the brand, and would look elsewhere in Asia for growth. There are 22 Boost Juice stores in Malaysia currently to grow to 40 in the next 18 months, backed up by six stores in Singapore targeted to grow to 25 to 30 stores. Boost Juice entered India 12 months ago and now has four stores.